ACCIDENT: Woman was snowshoeing down glacier with friends. A German graduate student on a spring break trek died Sunday after falling 90 feet into a crevasse while snowshoeing down a glacier about 45 miles south of Delta Junction. The body of Karoline Frey, 27, was recovered on Idems Peak at about 7 p.m. Monday and flown to Fairbanks, Alaska State Troopers said. Troopers withheld Frey's name until Tuesday and her mother in Altensteig, Germany, could be notified. Frey was working on a doctoral degree at the University of Alaska Fairbanks. She came to UAF's Geophysical Institute in 1999 to study sea-ice geophysics. While at the institute, she studied the ice environment in Barrow. Martin Stuefer was one of three friends on the ski trip Sunday with Frey. Stuefer said the group decided to ski and snowshoe to the summit of Idems Peak. They made it up easily and retraced their steps back down. "There was no sign of danger when we went up," he said. Frey was leading the way down when the snow gave out, Stuefer said. She fell through an opening about 3 feet in diameter hidden by a snow bridge, he said. Stuefer said he and the two others in the group, Tim Dennenbaum and Tina Din, could see no sign of Frey after she fell. "I looked down the crevasse and I couldn't see the bottom," Stuefer said. "We cried down and we never got an answer." The group had neither cellphone nor radio. Leaving Dennenbaum and Din at the scene, he skied down the mountain, drove to Pump Station No. 10 of the trans-Alaska oil pipeline and asked workers to call for help. 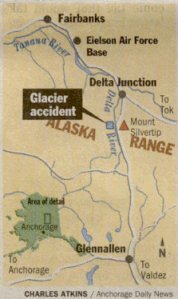 Troopers initially responded in a helicopter but were unable to land on the glacier. At about 9:30 p.m., the Alaska National Guard landed, found the body, but were unable to recover it that evening. The Alaska Mountain Rescue Group resumed the recovery effort Monday. Frey was buried beneath several feet of ice and it took four hours to dig her out, said Soren Orley of the rescue team. He said when people travel on an unfamiliar glacier they should rope together as a safety precaution. A memorial service for Frey at the Geophysical Institute is being planned.